Anthony Di Lorenzo is the bar manager of CHC ARBA in Genova. He makes two cocktails for us, one with Whisky and Benedictine and the second with Aquavit and Campari. My name is Anthony Di Lorenzo and I am the bar manager of CHC ARBA. I began working on boats because I always wanted to travel, but started in this industry six years ago in my hometown Recco near Genova, in a bar where Marco Pavone taught me everything about cocktails and service. 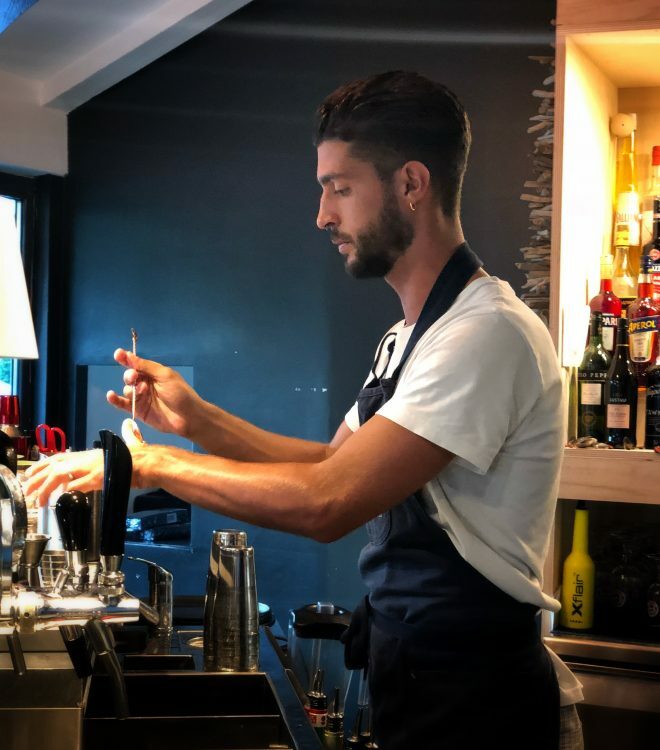 I moved to Paris and worked at Prescription Cocktail Club where I started as barback before becoming a bartender, then I work at Ballroom as head bartender where I met Rory and Robin my future colleagues at Little Red Door. In 2016 a client hired me to become her bar manager in Tulum, Mexico with Anatole Boutant who moved there with me. Afterwards we did some consulting in Mexico City until we moved back to Europe. I worked at Experimental Beach in Ibiza before coming back to Paris to work at Little Red Door… my dream bar and my dream team. During Christmas I came back home and my future business partner Lucca Bruzzese proposed we open CHC ARBA together. My dream bar would be a chiringuito on the beach, somewhere in the Caribbean where I can work barefoot. Of course tiki drinks would be the star of the show with small tapas, like guacamole or pasta (of course, because I am Italian). I’d have Italian music playing from the 60’s to the 90’s, everyone hates it, but I love it, so I’d add a little atino music to balance things out, just like a chiringuito. I go to visit my grandmother, the woman in my life in my hometown Recco. Even though she is 90 years old, I love to spend time with her and she is the one who understands me the most. Otherwise, I love riding my KTM Supermotard in the mountains. My favourite spirit is mezcal because when I was in Mexico I went to many palenques where they distilled mezcal and I love the craft involved in the way they make it. I like using it in cocktails because of the smokiness and the floral notes with an intense flavour it adds to the character of a drink. My favourite brands are Mano Negra or Papa Diablo. In my experience, it’s about technique, balance and service. For me you also need a bar to have a good ambience, because that’s what you remember in the end. I love sherry, from Pedro Ximenez which is sweet to something more dry like a fino. But Amontillado is my absolute favourite sherry. You need to go to Mexico city and visit Casa Franca. It’s a bar in an apartment where you can listen to live music. In Paris you should obviously go to Little Red Door because for me it’s the best bar I’ve worked in… it’s definitely the place to be.